For the library in Minnesota, see Houston Public Library (Minnesota). 1907 Sanborn map showing the location of the Carnegie Library and Houston Lyceum. The Houston Public Library system traces its founding to the creation of the second Houston Lyceum in 1854. The lyceum was preceded by a debating society, a special-interest mechanics' lyceum, and a circulating library. The lyceum's library eventually split into a separate institution at the end of the 19th century. In 1892, William Marsh Rice, a Houston businessman and philanthropist who later chartered Rice University, donated $200,000 for the construction of a free public library. The facility opened in 1895 and obtained its own building in 1904 with financial assistance from Andrew Carnegie. Julia Ideson was named its first librarian and she hired one employee. Located at the corner of Travis and McKinney in what is now known as Downtown Houston, it originally housed 10,000 volumes. By 1907, 10,000 Houstonians held accounts at the library. By 1913, the library counted seven persons on its payroll. The city changed the name from Carnegie Library to Houston Public Library in 1921. By this time, they had outgrown their space and relocated several staff members to the Harris County Courthouse. A few years later, the library sold its property to raise money for a larger facility. The library board selected a lot once occupied by Thomas M. Bagby, a co-founder of the 1848 Houston Lyceum. They commissioned Cram and Ferguson as design architects, in consultation with William Ward Watkins and Louis A. Glover. The building was completed in two years and at a cost of $500,000. The Spanish Renaissance design draws from regional history, and includes carvings of explorers and missionaries of Texas. The second floor hall lay under a rotunda, fronted by an interior oaken gate with carved columns and entablatures. The new building opened with a collection of more than thirty thousand volumes. The building constructed as Houston's Central Library in 1926 was later named the Julia Ideson Building in her honor. The board for the Houston Carnegie Library had planned for universal access to the facilities. However, those working at the library turned away African-Americans educators who visited in 1907, while ostensibly referring the matter to the trustees. A group of African-American educators led by Ernest O. Smith lobbied local white leaders and the Carnegie Foundation for a library to serve the black community. The Colored Carnegie Library of Houston opened in 1913 with an African American board of trustees and management. It was transferred to the management as a branch library of Houston Public Library in 1921. The library system racially desegregated in 1953. [dubious – discuss][not in citation given] Beforehand, blacks were permitted use of the Colored Carnegie Branch and deposit stations located at a park, a high school, and an elementary school; whites were permitted use of the main library, six branches, two bookmobiles, and several deposit stations. Desegregation occurred after a letter printed in the Houston Informer from several prominent black Houstonians, including Smith v. Allwright plaintiff Lonnie E. Smith, stated they would prefer a voluntary desegregation program despite their likelihood of winning a lawsuit; shortly before the letter was printed, Sweatt v. Painter was decided by the U.S. Supreme Court, which challenged the "separate but equal" legal doctrine. In June 1953, Mayor of Houston Roy Hofheinz told the HPL board that library facilities should no longer be segregated. On August 21, 1953, library facilities for high school students and adults were desegregated – without public announcement to the black community. The library system now consists of 35 neighborhood libraries, including four regional libraries, the Clayton Library Center for Genealogical Research in the Museum District, and the Central Library in Downtown. Central Library consists of the Julia Ideson Building and the Jesse H. Jones Building, constructed in 1976. The HPL administrative offices were moved out of the Jones Building, freeing 12,600 square feet (1,170 m2) of space. Lisa Gray, of the Houston Chronicle, said the renovation made the Jones Building "less of a public space devoted to reading, and more of a public space, period." The offices moved to the Marston Building. In 2012, the Marston Building was sold by the City of Houston, and the HPL administrative office moved to the recently restored Julia Ideson Building while other staff offices moved back to the Jones Building. Additions in the 2000s include McGovern-Stella Link Neighborhood Library (2005), HPL Express Southwest (2008), and HPL Express Discovery Green (2008). A new building for Looscan Neighborhood Library opened in 2007, replacing a 1956 structure. The Jones Building closed for renovations in 2006 and reopened in 2008. That same year, the Houston Press heralded the project as Houston's best renovation in its annual awards. In 2010, due to a budget shortfall, the library system reduced its hours. During the same year the system put its decades-old city directories online. During the Jesse H. Jones Building remodeling the HPL administrative offices moved to the 22,000-square-foot (2,000 m2) Marston Building in Neartown Houston. The City of Houston spent $1.3 million to renovate the Marston Building to accommodate HPL staff. Prior to the remodeling, the HPL administrative offices were located in the Jones Building. In 2012 HPL administrative offices moved to the Julia Ideson Building after its historically correct renovation and the addition of a wing which was in the original design, but was not built at the time due to lack of funds. This addition houses the Houston Metropolitan Research Center (HMRC) which is the archival center of the Houston Public Library System. The Marston Building was sold in 2012 by the City of Houston. In addition to the Central Library and Clayton Library, there are 35 neighborhood libraries, including four regional libraries, all located within the city of Houston. In addition, HPL has a partnership with the Harris County Public Library's Clear Lake City-County Freeman Branch Library in the Clear Lake City community of Houston. Also, the Parent Resource Library in the Children's Museum of Houston is considered part of the Houston Public Library system; however, its staff are employed by the museum, rather than the City of Houston. In partnership with the Harris County Public Library, which will operate the branch, the Kingwood Branch in Kingwood is a "City-County" branch in exchange for $4.2 million to fund the building of a new 30,000-square-foot (2,800 m2) facility. At the time of its completion, the existing branch will be converted into a community center. HPL Express locations are library facilities located within existing buildings. Each express location contains three areas: one book center, one computer center, and one classroom facility. Morris Frank Library, an HPL Express Location (Fondren Southwest) - Located in a 12,000-square-foot (1,100 m2) section of the first floor of the Brays Oaks Towers. HPL Express Vinson (opening fall 2009) - Located in a 42,000-square-foot (3,900 m2) facility in the South Post Oak Multi-Service Center, adjacent to the new Vinson Neighborhood Library ; the total library facility will be double the size of the original Vinson facility. The HPL Mobile Express is a mobile computer training laboratory. ^ a b "About HPL". Houston Public Library. Retrieved 2018-01-20. ^ a b c d e Kleiner, Diana J. (2010-06-15). "Houston Public Library". Texas State Historical Association. Retrieved 2017-03-04. ^ Chapman, Betty T. "Story of public libraries took long time to write in Houston." Houston Business Journal. June 2, 2000. Retrieved on January 27, 2009. ^ Chapman (2004), pp. 6–9. ^ Chapman (2004), pp. 14–15. ^ Chapman (2004), pp. 21–25. ^ Malone, Cheryl Knott (1999). "Autonomy and Accommodation: Houston's Colored Carnegie Library, 1907–1922". Libraries & Culture. 34 (2): 95–112. JSTOR 25548712. ^ a b Malone, Cheryl Knott (2007). "Unannounced and Unexpected: The Desegregation of Houston Public Library in the Early 1950s". Library Trends. 55 (3). p. 673. doi:10.1353/lib.2007.0015. ^ Malone, Cheryl Knott (2007). "Unannounced and Unexpected: The Desegregation of Houston Public Library in the Early 1950s". Library Trends. 55 (3). p. 671. doi:10.1353/lib.2007.0015. ^ a b Malone, Cheryl Knott (Winter 2007). "Unannounced and Unexpected: The Desegregation of Houston Public Library in the Early 1950s". Library Trends. 55 (3): 665–674. doi:10.1353/lib.2007.0015 – via EBSCOhost. (Subscription required (help)). Cite uses deprecated parameter |subscription= (help); |access-date= requires |url= (help) Alternative method: https://www.researchgate.net/publication/254956573_Cheryl_Knott_Malone_-_Unannounced_and_Unexpected_The_Desegregation_of_Houston_Public_Library_in_the_Early_1950s_-_Library_Trends_553, registration required. ^ Malone, Cheryl Knott (2007). "Unannounced and Unexpected: The Desegregation of Houston Public Library in the Early 1950s". Library Trends. 55 (3). p. 667. doi:10.1353/lib.2007.0015. ^ Malone, Cheryl Knott (2007). "Unannounced and Unexpected: The Desegregation of Houston Public Library in the Early 1950s". Library Trends. 55 (3). p. 670. doi:10.1353/lib.2007.0015. ^ "In Memory of Mr. Seth Irvin Morris" (). Houston Public Library. August 2, 2006. Retrieved on January 27, 2009. ^ Gray, Lisa. "Beyond books." Houston Chronicle. June 20, 2008. Retrieved on March 11, 2010. ^ a b c "It's Worth the Wait Exciting New Renovation for the Central Library" (). Houston Public Library. Thursday February 23, 2006. Retrieved on June 30, 2010. ^ "HPL Express Southwest Grand Opening Archived 2008-12-16 at the Wayback Machine." Houston Public Library. January 1, 2008. Retrieved on December 13, 2008. ^ "Take to the air for short trips from Tucson Archived 2009-02-17 at the Wayback Machine." Arizona Daily Star. June 19, 2008. Retrieved on January 27, 2009. ^ "Adele B. Looscan Branch Replacement," () Houston Public Library. Retrieved May 23, 2008. ^ "Central Library Grand Re-Opening Celebration May 31 & June1, 2008" (Archive). Houston Public Library. Retrieved on January 27, 2009. ^ "Best Renovation (2008) Downtown Library" (Archive). Houston Press. Retrieved on September 28, 2015. ^ Turner, Allan. "Budget forcing cuts in library hours." Houston Chronicle. April 7, 2010. Retrieved on April 7, 2010. ^ Gonzalez, J.R. "Houston Public Library puts decades-old directories online." Houston Chronicle. April 13, 2010. Retrieved on May 11, 2010. 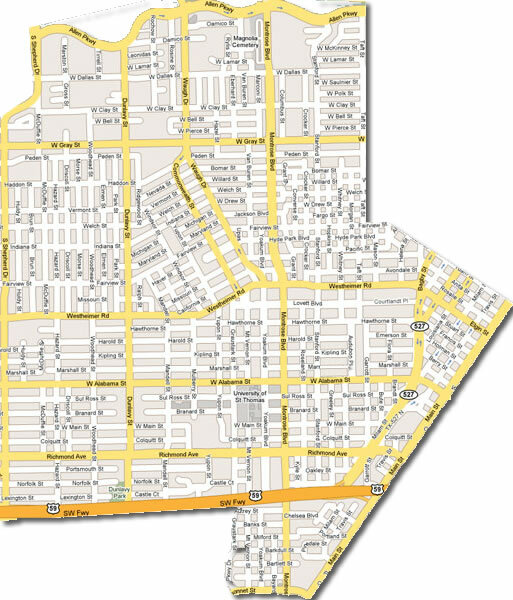 ^ Map of Neartown Archived 2018-10-05 at the Wayback Machine. Neartown Association. Retrieved October 20, 2008. ^ "GSD District Locations." City of Houston. Retrieved on June 30, 2010. "No. 117. Location Code MAR. Address 820 Marston. Location Name Marston Building. Zip Code 77019. Key Map 492M. Sq. Ft 22,000. ^ "City of Houston Public Library, Marston Building Archived 2011-07-15 at the Wayback Machine." Prozign Architects. Retrieved on June 30, 2010. ^ "The African American Library at the Gregory School Archived 2009-12-17 at the Wayback Machine." Houston Public Library. Retrieved on November 23, 2009. ^ Williamson, Harry (2007-02-15). "Kingwood library construction work to start this year". Houston Chronicle. Retrieved 2007-08-05. ^ "HPL Express Archived 2009-03-01 at the Wayback Machine." Houston Public Library. Accessed July 12, 2008. ^ a b "Electronic library to be built within new Multi-Service Center / City's first branch to have abundance of CDs, DVDs." Houston Chronicle. March 1, 2007. Accessed July 12, 2008. ^ "SOUTHWEST HOUSTON / Frank library to move, reopen in the fall. "Houston Chronicle. June 19, 2008. Accessed July 12, 2008. ^ "HIRAM CLARKE / Multiservice center, library set / City officials hope $10 million facility will earn LEED designation." Houston Chronicle. November 29, 2007. Accessed July 12, 2008. ^ "HPL Mobile Express Archived 2008-07-30 at the Wayback Machine." Houston Public Library. Accessed July 12, 2008. Wikimedia Commons has media related to Houston Public Library.